William D. Guth joined New York University Stern School of Business in 1972 and served as Chairman of Stern's Management Department from 1978 to 1989 and Director of the Center for Entrepreneurial Studies and the Harold Price Professor of Entrepreneurship and Strategy from 1989-1994. He was Professor Emeritus of Management and Strategy, and Coordinator of the International Study Program. Prior to joining NYU Stern, Professor Guth was on the faculty at the Harvard Business School from 1960 through 1968 and was a Professor of Business Policy at Columbia's Graduate School of Business from 1968 to 1972. He was also a part-time Visiting Professor of Strategy at the International School of Business, IMADEC University, Vienna, Austria, and a part-time Visiting Professor of Management at the Howe School of Management, Stevens Institute of Technology. 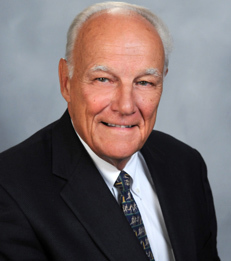 Professor Guth regularly published his research in the fields of strategic management and entrepreneurship in such journals as Strategic Management Journal, Journal of Business Venturing and Academy of Management Review. He served on the editorial boards of the Strategic Management Journal, Long Range Planning and the Journal of General Management. Professor Guth was co-author of the groundbreaking strategy book, Business Policy: Text and Cases (First, Second, and Third Editions, Richard D. Irwin, 1965, 1968, 1971) and founding editor, Handbook of Business Strategy (Warren, Gorham & Lamont, 1985), along with its annual updates in 1986, 87, 88 and 89. His most recent refereed journal article, "Developing New Avenues for Growth: Challenges Presented by Five Trends in the Global Environment," was published in September, 2009, in a special issue of the Journal of International Management. Professor Guth was the founding Chair of the Division of Business Policy and Strategy, Academy of Management from 1972-74. He was a Fellow of the Academy of Management, a Fellow of the Strategic Management Society, and was listed in Who's Who in America, and in Who's Who in the World. Professor Guth was active in executive development program teaching and in strategic management consulting with senior managers of business firms. He was a faculty member of executive development programs at New York University, Harvard, Northwestern, Dartmouth, Columbia and Duke, in addition to advanced management programs in more than fifteen foreign countries. He was a consultant to many American and foreign firms, including AT&T, General Electric, IBM, General Foods, Securities Pacific, E.F. Hutton, Merrill Lynch, ICI Ltd., Unilever and Union Carbide. He was a Principal of The MAC Group, Inc., a general management consulting firm with more than 15 offices in the U.S. and abroad, from its founding in 1966 until its acquisition in 1991 by Gemini Consulting. Professor Guth earned his B.S. from Washington University, his M.B.A. from Indiana University and his D.B.A. from the Harvard Business School.